IBM has just introduced the smallest computer in the world. Indeed, what you are seeing in the header image is the computer with the basics to work, an example of the extreme to which the technology giants have come with the miniaturization of components. Today begins the IBM Think 2018, an event in which the mythical technology company (whose spirit is still alive in the Lenovo Thinkpad hardware) presents its novelties, lets us savour the future with hardware that we will use in the coming years and hosts lectures on hot topics such as the blockchain. One of the novelties of this edition has been its new computer, the smallest PC in the world. Literally, IBM has introduced the smallest computer in the world. Indeed, what you are seeing in the header image is the computer with the basics to work, an example of the extreme to which the technology giants have come with the miniaturization of components. Of course, do not think that with this you can mount a mini-PC to work or play to the fullest. There is still a way to go. When we talk about miniature hardware we talk about the SNES Classic Mini or Raspberry Pi. The Raspberry minicomputer was, practically, a technological miracle that looks like a big board compared to the smallest computer in the world, IBM. The company has a race against itself for the miniaturization of the components. In 2015 they created a 7-nanometer transistor and last year they surprised us with a fully functional chip that went down in weight up to 5 nanometers. 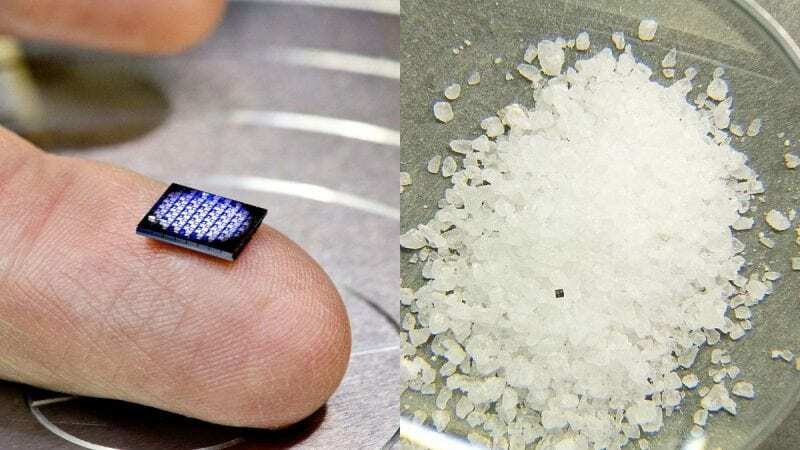 Now, directly, the nanometers as a scale have run out large and use a comparison with a grain of salt. Again, when we talk about the smallest computer in the world, we mean that, literally, it is smaller than a grain of salt. 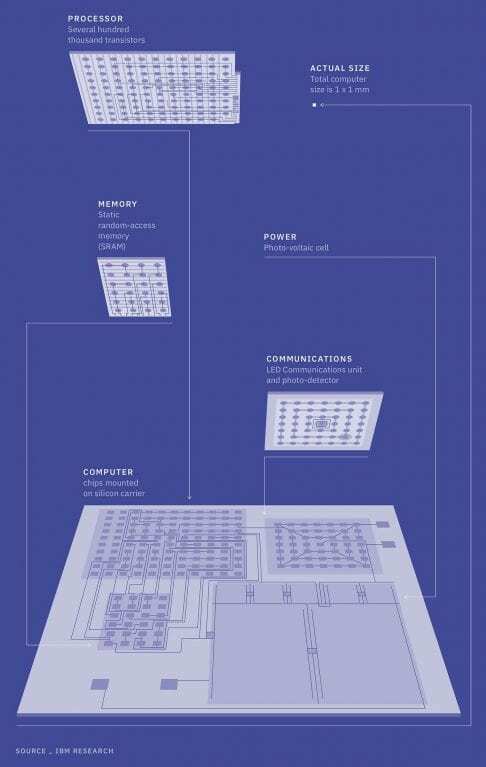 The size of the IBM computer is hard to believe, but what about its applications? Well, here we are talking about serious things. The power of the smallest computer in the world is not to take rockets. According to IBM, it has the power of an x86 chip of 1990 and, although it seems very scarce for the times, its applications are very interesting. To start, we need a microscope to see it well and, to continue, these computers can be stacked to multiply their power in a minimum size and, thus, perform tasks that are very fashionable. It seems that IBM wants to be able to perform certain tasks in artificial intelligence environments, as well as analyze data and perform tasks in the blockchain world. IBM has not yet given data on a specific use or task, but it has shown us a plan on this prototype in which we can see to what extent they have been able to arrive with the miniaturization of components. Now it only remains to see if this prototype goes from paper to reality and how it is used to make life a little easier. In addition to a tiny size that allows you to stack several of these computers, one of the advantages of miniaturization is what it costs to produce this computer. Producing the smallest computer in the world costs less than 10 cents, which is a real madness.